The BAU were investigating Katie Hammond’s disappearance. The teenager had been set to meet up with friends when she accidentally left her cell phone in the taxi and had no way to reach them. But Katie’s victimology matched two other cold cases. Katie and the other two victims all looked like and they had all disappeared around the same area in Manhattan. So Prentiss believed that they were dealing with the same Unsub and she told her team that if it was the same guy that Katie still had a chance. The other two victims hadn’t been killed until after a week in captivity and Katie had only been gone for five days. So Prentiss said Katie might have a few more days yet Katie’s case on the other hand didn’t give the team anything to go on. Katie hadn’t been picked up by any surveillance cameras after she left the cab and the one suspect they had in the case had been cleared. However, the team had hoped to use the two cold cases to determine a pattern. And what they knew about their Unsub wasn’t pleasant. They knew that he liked taking teenagers around the age of fifteen to sixteen and that he had a blood fetish. The girls had been drained three liters of blood and the team had no idea what he was doing with it. 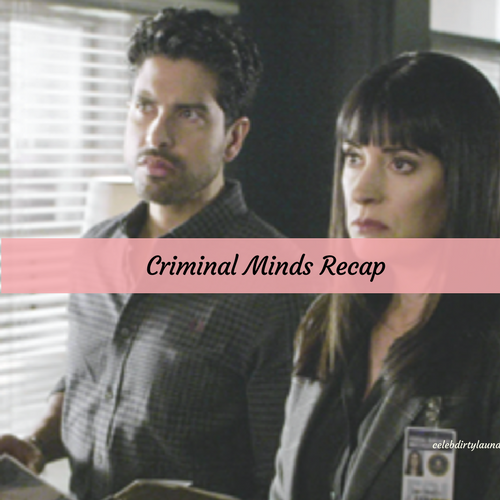 Yet, Prentiss had said that they couldn’t rule out a vampire fetish that makes the Unsub want to drink to the blood. So the team got a better handle on things once they landed in New York. There, they were able to go through the old case files and they realized that the other two girls had been runaway. They had come from bad homes and had chosen to live on the street. So that made them a little more high risk than Katie because runaways didn’t have anyone looking out for them or reporting them missing if they suddenly disappeared. Though Katie was different. She had two parents and a sister that were all worried about her and who wouldn’t give up on finding her even everyone else did. And so that said something about the Unsub. It said that he was working his way to girls like Katie and that there were other victims out there that they still didn’t know about. But going through the many missing person’s files that a big city like New York had was going to take some time and that wasn’t fast enough for Katie’s parents. The parents had been brought in and questioned about whether or not they ever noticed someone watching their daughter. Which were general questions however the parents’ minds had already gone to the worst possibility. They knew the statistics like everybody else and had feared that their daughter was dead. So the team had had to talk them out of that mentality. Only they had reminded the now divorced couple that they needed their help with finding their daughter and so they had been asked if Katie had any reason to be in Hell’s Kitchen. Hell’s Kitchen was identified as the Unsub’s comfort zone. He liked hunt in that area and he often left his victim there once he was done with them. However, it just didn’t make sense if he went out of his way to look for Katie and so Katie’s father had been forced to admit the truth. Katie had apparently been visiting her father despite the custody agreement her parents had. So it had been there little secret. She would take the three trains to meet up with him and she must have been spotted by the Unsub who noted her pattern. Yet, Katie’s mother had gone off when she heard about what the two were doing. She had said that it had been too risky for Katie to travel that far alone and she made sure to mention that Katie could have been found sooner if her ex had just told the truth. And she had a point. Once the team was able to confirm that Katie had been in Hell’s Kitchen, they track down the surveillance cameras in that area and had noticed a van with blacked out windows. Though the person that technically owned the van had turned out to be dead even as the taxes were still getting paid. So they still didn’t know who was currently using the vehicle when Katie disappeared on her way to her father’s, but they traced the van and found the hidden hole inside that led to the underground sewer system. So the team found out where the Unsub was holding Katie and they went into the tunnels to find her when Walker had gotten hit from behind. But luckily Walker was safe. The Unsub had just hit him the one and fled however Walker was able to get back up and shoot the Unsub before anyone else could get her. And so Katie was rescued from a man that drank her blood because he thought it gave abilities, but the BAU eventually found out what happened to Reid. Reid had pretended like everything was fine and that he could stand up against the drug dealers in prison and in actuality he just made everything worse. Reid had poisoned the latest cocaine batch and most of his cell block including the one person that was looking out for him had gotten sick.